A stay at a Natural Campsite is an ideal way for children to discover nature. On and around the site they will be able to climb trees, build huts, catch tadpoles and play in the grass. Camping in the great outdoors is much more varied and exciting than a ‘regular’ holiday. The site descriptions in The Green Guide, the app and on this website provide useful information about amenities such as hot water, play equipment, wet weather facilities, etc. The Natural Campsite Pass is valid for the whole family and allows you to visit one of the Natural Campsites together. Many sites offer discounted rates for children, while some allow very small children to stay free of charge. The Discovery Kit includes everything children need to discover the wonders of nature. Most Natural Campsites have Discovery Kits that you can borrow: ask the site manager. Of course, intrepid young explorers might like to have their own equipment. The Discovery Kit guarantees hours of educational fun! We have two fun pictures for you to download and print. 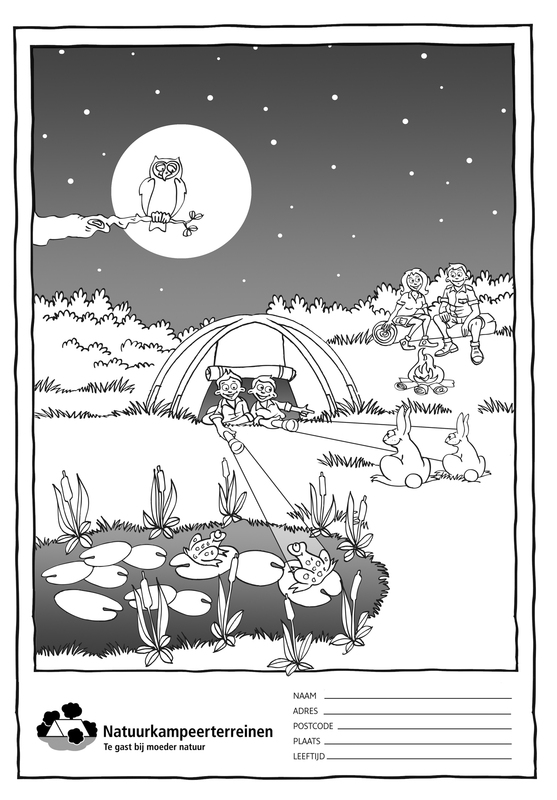 Young children will enjoy colouring them in, inspired by nature itself!